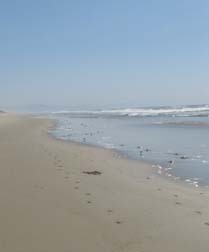 The beach is located one mile south of Moss Landing. Take Potrero from Highway 1. The beach and dunes at Salinas River State Beach are part of Monterey Bay’s unique coastal dune system and it is home to many species of birds, including the California brown pelican, red-tailed hawk, American kestrel, western snowy plover, western gull, black phoebe, western scrub-jay, California towhee, white-crowned sparrow, and more. The beach is a popular fishing site. The beach is located one mile south of Moss Landing. Take Potrero Road from Highway 1.